Lower crossed syndrome describes the characteristic pattern of dysfunctional tone of the musculature of the pelvic girdle/lumbosacral region of the body. This condition is given its name because an “X,” in other words a cross, can be drawn across the lower body. One arm of the cross indicates the muscles that are typically tight/overly facilitated and the other arm of the cross indicates the muscles that are typically weak/overly inhibited. This condition is designated as the lower crossed syndrome because a similar pattern of dysfunctional muscle tone called the upper crossed syndrome is found across the shoulder girdle/cervicothoracic region (see blog articles for the upper crossed syndrome). Both the upper and lower crossed syndromes were initially described and named by the Czech physician and researcher, Vladimir Janda. Sacral base angles. A, Decreased anterior tilt and hypolordotic lumbar spine. B, Normal anterior tilt and normal lordotic lumbar spine. C, Lower crossed syndrome with increased anterior tilt and hyperlordotic lumbar spine. Permission: Joseph E. Muscolino. Kinesiology: The Skeletal System and Muscle Function, 3ed (2017), Elsevier. Note: Swayback is a term that is sometimes used to describe the increased lordotic curve of the lumbar spine that is part of the lower crossed syndrome. Sometimes the term swayback is used for the opposite postural distortion pattern, that is a posteriorly tilted pelvis with a hypolordotic lumbar spine (rounded back). The primary cause of lower crossed syndrome is a characteristic pattern of tight hip flexor and low back extensor musculature (paraspinals: erector spinae and transversospinalis) along with weak anterior abdominal wall and gluteal musculature. It is typical to think of the effects of these muscles upon the thigh and spine. However, their postural effect upon the pelvis is functionally more important. Tight hip flexors create increased anterior tilt of the pelvis, as do tight low back extensor muscles. Anterior abdominal wall and posterior gluteal musculature are posterior pelvic tilters, so if they are weak, they will have little ability to oppose the tight anterior pelvic tilters (Table 1). The result is an excessively anteriorly tilted pelvis, which then creates an increased lumbar lordotic (hyperlordotic) spine. The degree of anterior tilt of the pelvis can be measured by what is termed the “sacral base angle.” A line is drawn along the sacral base, another line is drawn horizontally, and the angle located where these lines intersect is measured; this is the sacral base angle. 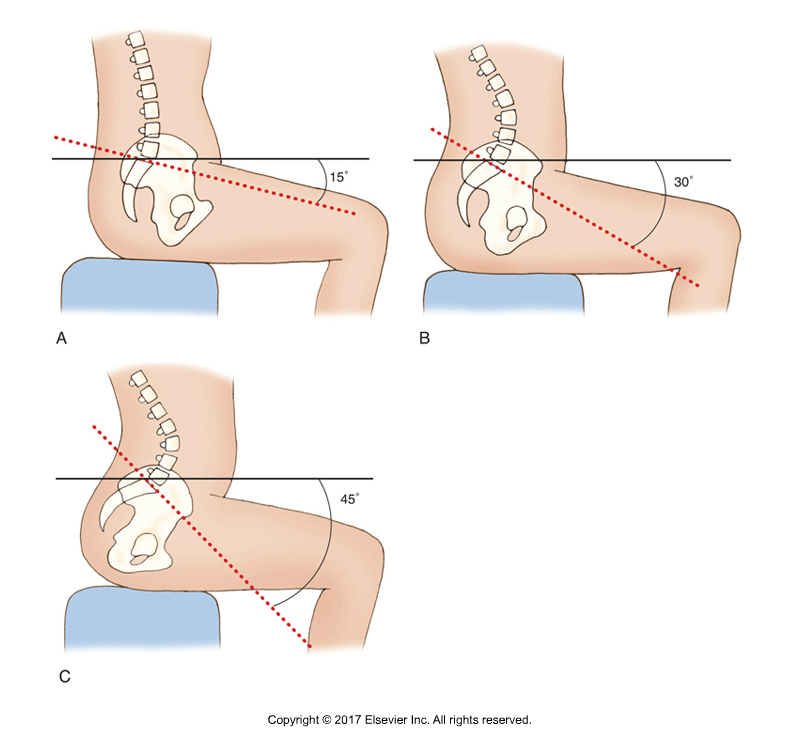 The greater the angle, the greater the anterior tilt of the pelvis. Although there is controversy about exactly what pelvic neutral posture is, it can be fairly confidentially stated that pelvic neutral is somewhere around a sacral base angle of 30 degrees. Hip flexors are usually tight because we spend so much time seated with the thighs flexed at the hip joint; therefore by the principle of adaptive shortening, hip flexors shorten and tighten. Low back extensor musculature (such as the erector spinae group and multifidus of the transversospinalis group, and even the quadratus lumborum [QL]) is often tight because we spend so much time working down in front of ourselves. When we bend forward, low back extensor musculature is used eccentrically to control our forward descent into trunk flexion; it is used isometrically to maintain forward-bent posture of the trunk; and it is used concentrically when we return to an extended/erect position of the trunk. Wearing high-heeled shoes also tends to increase lower crossed syndrome because many people compensate for the posture created by high heels with increased pelvic tilt. Anterior abdominal wall musculature is usually weak because we rarely exercise our trunk into flexion up against gravity. The gluteus maximus is often weak because even though we often extend our thigh at the hip joint when walking, the gluteus maximus does not usually engage when walking on level ground. It is usually only recruited for hip joint extension when greater resistance is given, such as when walking uphill, upstairs, on a labile surface such as soft sand, or when running. The net result of these overly tight/facilitated muscles and these overly weak/inhibited muscles is an increased anterior pelvic tilt with an increased lumbar lordosis. Often, the presence of lower crossed syndrome posture will predispose the client/patient to develop upper crossed syndrome. Lordosis is a curve of extension. Therefore, if the lumbar spine is hyperlordotic, the center of weight of the trunk shifts posteriorly. To compensate, the thoracic spine often increases its kyphosis (curve of flexion) to bring the center of the weight back anteriorly. Increased thoracic kyphosis then predisposes both hypolordosis of the lower cervical spine with concomitant hyperlordosis of the upper cervical spine and protracted head posture, and protracted shoulder girdles with medially (internally) rotated arms; in other words, upper crossed syndrome. In addition to the facilitation/inhibition of musculature by the nervous system, once the lower crossed posture has been assumed for a long time, this posture is further entrenched by the formation of fascial adhesions (“fuzz” in the parlance od educator Gil Hedley) in the tissues. In time, even the bones involved, primarily the vertebrae of the lumbar spine, might gradually deform based on the physical forces placed upon them; the increased extension posture can cause the posterior vertebral bodies of the lumbar spine to compress, resulting in a wedge shape that only serves to further perpetuate the extension posture.